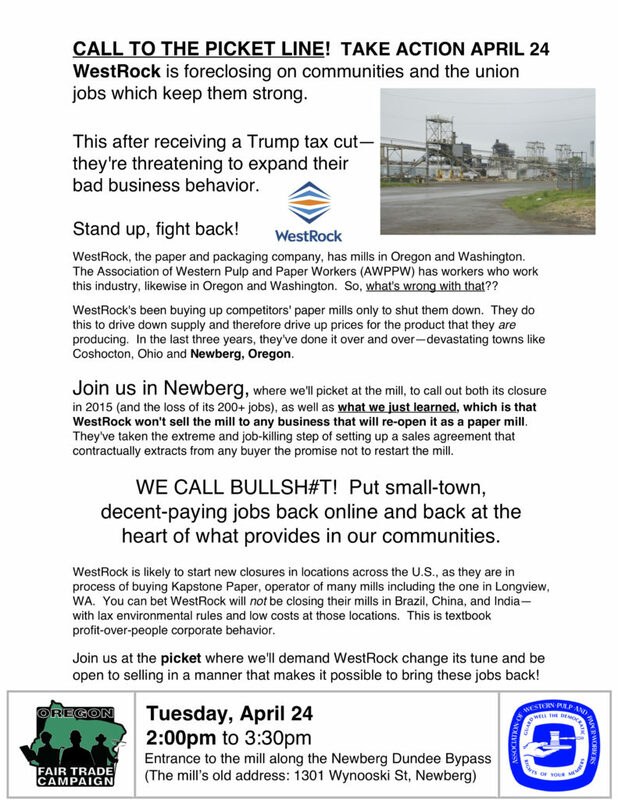 There are potentially buyers who want the Newberg mill and want it to run as a paper mill, and want it to be union. WestRock — the company which in 2015 bought the mill and only two weeks later shut it down — however, (perhaps illegally) is committed to sell only to buyers who contractually agree not to restart it as a mill. That’s just unacceptable. Join us in Newberg, where we take action over this. Multinational corporations that push their operations to the Global South for cheap labor and lax environmental regulation — that’s a story we know well. But it’s a new low when, in the wake of their plant shutdown, they additionally prevent communities from accepting other businesses that would re-employ the lost union jobs. This entry was posted in Oregon Jobs Lost. Bookmark the permalink.